I don't really have time to write a thoughtful post in the aftermath of the election. I will soon, and I have a lot to say about the changes that I believe Democrats need to make in order to be more successful in 2008. In short, I think we need to really listen to what people said when voting; both what the actually said to exit pollers and what they said implicitly in choosing a candidate. 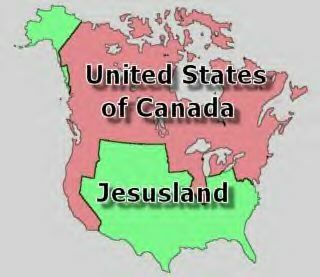 For now though, I thought I would share a map that a buddy of mine from Canada sent me yesterday. It's pretty funny, and in light of the fact that over 1/3 of all voters nationwide identified themselves as "evangelical", perhaps it's not that far from the truth.